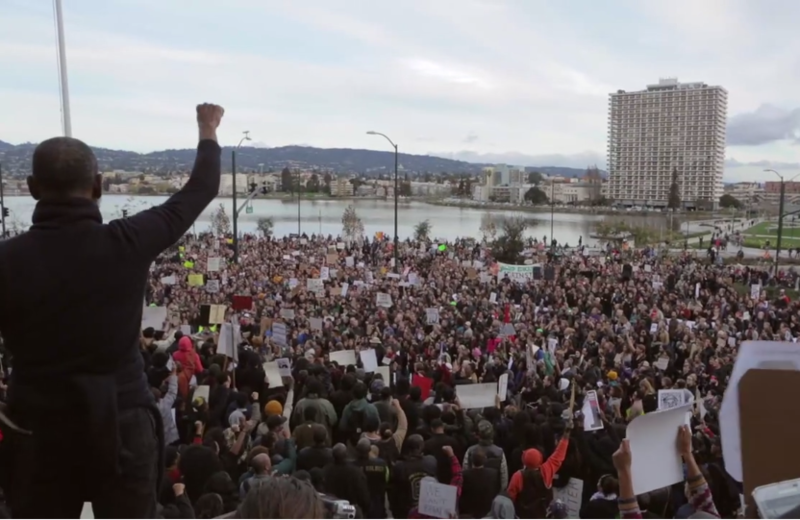 Still from Bert Johnson's recent Millions March Oakland demonstration. Though gentrification and displacement of longtime residents are certainly at the forefront of the minds of Oaklanders, for the time at least, Oakland appears to be holding onto its diversity. On Monday, Oakland was named the most diverse city in the country with a population less than 400,000, according to recent graphic by the folks at Priceonomics, who crunched data from the Census' 2013 American Community Survey. To make the chart, Priceonomics looked to economist equations for determining market diversity, as well as the ecological equation known as the Simpson diversity index, and calculated each city's HHI (Herfindahl-Hirschman Index). "We treated our major ethnic and racial groups like 'companies,' and each group's 'market share' was the percentage they comprised of the city's population." As the graph shows, Oakland came out on top, with an HHI of 0.232. The cities at the bottom of the chart have a majority of racial minorities, meaning, for instance, that El Paso, Texas is overwhelmingly made up of Latinos, and hence, not very diverse. Detroit, similarly, is mostly made up of African Americans, with an 80.7 percent makeup, so it's considered the least diverse city on the chart, with an HHI of 0.665. Of course, as rents continue to rise in the Bay Area and more San Franciscans migrate to the East Bay, we expect these demographics to change. But we might have to wait until the 2020 census for any definitive proof or catastrophic change. In the meantime, we are interested to see what Oakland will become in the next few years, but we're also hopeful that the city’s rich history as a thriving hub for black culture (and minority culture in general) will remain a big part of its identity in the future.